Double bandas are furnished with a double bed and a private bathroom. Maili Saba Camp is located on the rim of the Menengai Crater, 7km north of Lake Nakuru in the Rift Valley. The camp is a sanctuary of tranquility and conviviality that rejects the rigidity of modern life. It's tucked away on the edge of the magnificent, dormant, area that embraces a warm casual atmosphere within African simplicity. The camp is conveniently hidden at just a twenty minutes' drive from Lake Nakuru National Park. Here, game viewing can be combined with a quiet picnic overlooking the flamingo dotted lake. 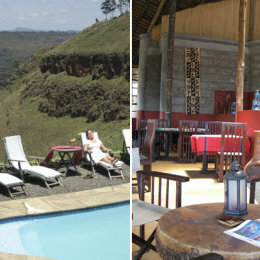 Maili Saba Camp offers a comfortable, relaxed and secure environment where every level best is done to suit your needs. Each grass-thatched tented banda has its own unique view on the crater. The bandas are all equipped with comfortable beds, a pleasant veranda or private terrace. Rinse of the safari dust under your spacious shower with all required facilities. Oil lamps sets a romantic mood in the camp's rustic restaurant and bar, while during breakfast you can enjoy the magnificent, silent, crater view. Dishes consist of fresh home cooked western and more Swahili influenced meals. 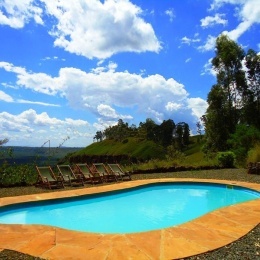 Amazing location with great view over Menengai Crater. The family cottage we had booked was not available (and the cottage does not have the crater view suggested on the website). The alternatives were acceptable but it would have been great to know in advance as we had been in touch with the camp manager via sleepout. No sign of 'sorry' or compensation either. Food was delicious. Limited wine selection. Food and service was particularly good. Spacious family hut, great view!